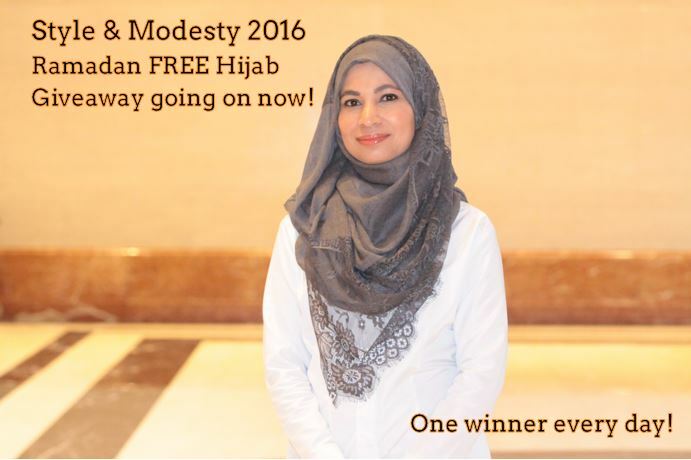 The Style & Modesty 2016 Ramadan Giveaway is well underway. So far, we have selected 12 winners and they will soon be receiving one of the beautiful scarves from our collection by their choice in the mail, Insha’Allah. Some of our most popular scarves having been our Gold and Silver Shimmer hijab, followed by the soft jersey cotton hijabs. Also favored are the floral viscose prints that are lightweight but still provide excellent coverage, perfect for the summer. Take a look at our many varieties, there is certainly something that will catch your eye. Congratulations to all of our 2016 Ramadan Giveaway winners! May all of our subscribers have a blessed Ramadan and continue to let us help you preserve your modesty. If you have enjoyed participating in this promotion, we would like to remind you that it is only possible with sisters like you who sign up and share with your friends, family and community about the products we provide. InshaAllah our collection will continue to expand and improve as we all help each other grow, for this life and the next. It’s not too late to enter! Click the picture above to be directed to our entry from. We will continue to draw a new winner from those who sign up for our newsletter every day for the rest of Ramadan. All winners are notified via email, and required to create a login account at http://www.styleandmodesty.com/store/login.php. Then you can select the hijab of your choice and place it in your shopping bag, we will email you a unique code to place the order at free of charge, your order will be processed immediately. This way, we can process your order faster, and keep you up to date, Insha’Allah. This entry was posted on Saturday, June 18th, 2016.